Cold weather got you down? 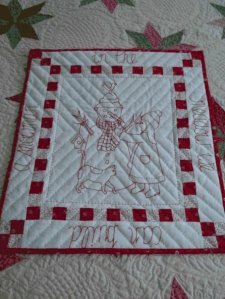 Perk up with this charming project from Kaaren Johnston of The Painted Quilt. This pattern comes complete with lettering forms for the wording around the edge of the quilt as well as the pattern for the design in the middle. Enjoy! Finished Size: About 17" x 20"